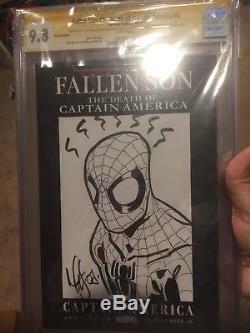 Mark Brooks hand drawn sketch cover! Both sides have a drawing and the book is graded by CGC as 9.8. Mary Jane on the back and Spider-Man on the front. 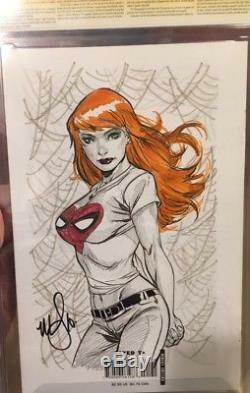 The item "Mark Brooks Double Sketch Cover! Mary Jane & Spidey Cgc 9.8" is in sale since Saturday, July 22, 2017. This item is in the category "Collectibles\Comics\Original Comic Art\Drawings, Sketches". The seller is "pqcollectibles_com" and is located in Caldwell, New Jersey. This item can be shipped to United States, Canada, United Kingdom, Denmark, Romania, Slovakia, Bulgaria, Czech republic, Finland, Hungary, Latvia, Lithuania, Malta, Estonia, Australia, Greece, Portugal, Cyprus, Slovenia, Japan, China, Sweden, South Korea, Indonesia, Taiwan, South africa, Thailand, Belgium, France, Hong Kong, Ireland, Netherlands, Poland, Spain, Italy, Germany, Austria, Russian federation, Israel, Mexico, New Zealand, Singapore, Switzerland, Norway, Saudi arabia, Ukraine, United arab emirates, Qatar, Kuwait, Bahrain, Croatia, Malaysia, Brazil, Chile, Colombia, Costa rica, Panama, Trinidad and tobago, Guatemala, Honduras, Jamaica.